The variety of lenses and openness that is brought to the research process shapes both academic research and the application of knowledge to real-world settings. Researchers who endeavor to contribute both rigor and relevance require a wide range of methodological tools and a clear understanding of how such tools frame the questions to be answered, as well as the methods used and potential outcomes. It is important that both researchers and publication gatekeepers clearly understand the impact of philosophical framing on research methods and findings. Drawing on research related to the use of social media to facilitate product innovation “crowdsourcing,” the authors consider the implications of alternative research scenarios on five key dimensions of research: epistemology, theory, review of literature, stakeholder perspective, and rigor-relevance. Examples of existing and emergent topics within the research field of crowdsourcing are provided to illustrate methodological pluralism. Before we begin our discussion of the impact of philosophical framing, we offer some background to help situate the reader within the context in which the discussion will progress. There is little disagreement that the widespread use of the Internet combined with new social media technologies is changing not only our personal lives, but also our workplaces, our communities, our society, and our world. We are seeing more and more examples of how individuals, organizations, and governments are leveraging the power of the Internet to bring attention to social, political, and personal issues (Morello, 2007; Magid, 2009; Webster, 2009). Budding entrepreneurs are leveraging the reach of the Internet to start new businesses (Howe, 2008; Brabham, 2008a, 2008b, 2009; Lakhani & Panetta, 2007; Trompette et al., 2008; Chanal & Caron-Fasan, 2008; Feller et al., 2010). One growing area of interest is the use of social media tools to tap into the knowledge and creativity of the “crowd.” Individuals from around the world are helping to complete tedious tasks more quickly, solve complex problems, and create new profit centers for businesses small and large (Nambisan & Sawhney, 2008; Sawhney, Verona, & Prandelli, 2005). 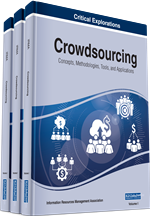 Turning to the crowd for their knowledge and creativity is often referred to as “crowdsourcing,” a term coined by Jeff Howe a writer for Wired magazine (Howe, 2006). Howe noticed that more and more companies were taking advantage of the Internet to reach out to the crowd to complete a variety of tasks historically accomplished using internal resources. Each day we are seeing companies both small and large leverage crowdsourcing for problem solving (Archak, 2010; Lakhani et al., 2007), data collection (Chilton, 2009), knowledge sharing (Wasko & Faraj, 2000; Allen et al., 2008), market research (Whitla, 2009), and even new product innovation (Prandelli, Sawhney, & Verona, 2008; Jeppesen & Frederiksen, 2006; Nambisan & Sawhney, 2008).